We know exactly the kind of build you'd do yourself if you had the time â€“ great paint over every inch (even the undercarriage), custom luxury leather interior with A/C, and a gleaming performance-built small block under the hood. So rather than dream of the day you can build one, this 1938 Ford Deluxe is ready for you right now. This is the perfect blend of old an new. The chrome trim that starts at the base of the grille parts at the Ford emblem and runs as an unbroken line down both sides of the all-steel body. It serves as the best way to highlight the iconic silhouette that ends in the Deluxe's humpback design. Chrome bumpers, chrome wheels, and whitewalls make this '38 look like Greased Lightning. But you'll do more than just admire the iconic elements of vintage times when you look at the paint. The red that has been applied to this classic instantly lets people know there was a big investment in modern paint. The luster of the red rivals the brightwork for shine â€“ even on the running boards! Plus, the updated windshield, tinted windows, LED taillights, and big dual exhaust tips are all clear indicators that there is a lot of special touches within. One look at the red and cream interior, and you know you're in for a level of comfort that is far superior to anything that came out of the '30s. The two-tone on the custom leather bucket seats is repeated on the rear bench, door panels, headliner, and even the trunk for a truly thoughtful appearance. You'll slip behind the classic Ford two-poke steering wheel. Not only is this a fun vintage touch, but also it gives you a clear view of the upgraded dash that's full of classic-style VDO gauges set in a premium wood panel. A car of this caliber is one you're going to want to drive everywhere, so it has been upgraded with a long list of luxury comforts that include power windows, an AM/FM/CD stereo with iPod hookup, and ice cold R134a air conditioning. Grab your sunglasses before looking under the hood. With the air grabber, valve covers, compressor, ignition, and so much more polished to a mirror shine, you'll be proud to show this one off at the car shows. But beyond the flash is the substance of a 350 cubic-inch V8 that's been given performance upgrades such as an Edelbrock four-barrel carburetor and shorty headers. And while you're checking out the full package, don't forget about the undercarriage photos. Here you'll see how everything on this custom build was covered in the bold red, right down to the frame. You're also going to spot great upgrades like the Mustang II-style tubular front suspension, power steering, three-speed automatic transmission, and front disc brakes. This is such a good cruising machine that it even comes with an aluminum radiator and electric fan. So you can be in traffic with the A/C pumping, and this custom build remains running cool. 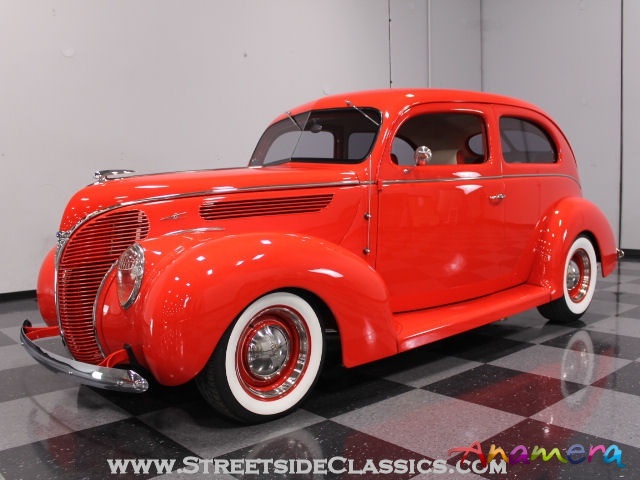 Complete with restoration photos, this '38 Ford street rod has a well-coordinated level of showmanship and usability that combines for a very versatile package. It's more than just the car you take to the show; it's the one that can be relied on for everything from the Power Tour to those days you just feel like playing hooky. That's true value in a custom car. Call today!! !